What’s the word of the year? NEW YORK (AP) — Misinformation, as opposed to disinformation, was chosen Monday as Dictionary.com’s word of the year on the tattered coattails of “toxic,” picked earlier this month for the same honor by Oxford Dictionaries in these tumultuous times. 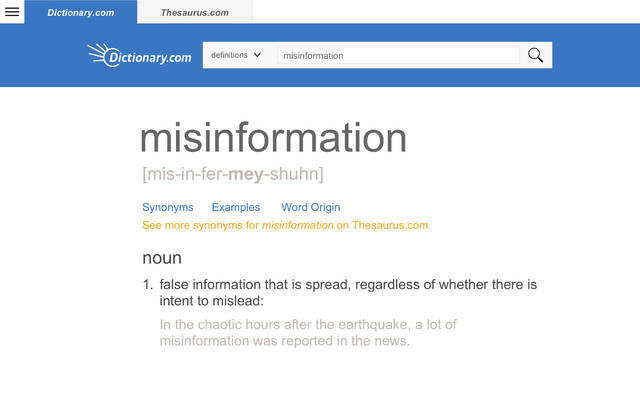 Jane Solomon, a linguist-in-residence at Dictionary, said in a recent interview that her site’s choice of “mis” over “dis” was deliberate, intended to serve as a “call to action” to be vigilant in the battle against fake news, flat earthers and anti-vaxxers, among other conduits. It’s the idea of intent, whether to inadvertently mislead or to do it on purpose, that the Oakland, California-based company wanted to highlight. The company decided it would go high when others have spent much of 2018 going low. In studying lookups on the site that trended this year, Dictionary noticed “our relationship with truth is something that came up again and again,” she said. For example, the word “mainstream” popped up a lot, spiking in January as the term “mainstream media,” or MSM, grew to gargantuan proportions, wielded as an insult by some on the political right. Other words swirling around the same problem included a lookup surge in February for “white lie” after Hope Hicks, then White House communications director, admitted to telling a few for President Donald Trump. The word “Orwellian” surfaced in heavy lookups in May, after a statement attributed to White House press secretary Sarah Huckabee Sanders accused the Chinese government of “Orwellian nonsense” in trying to impose its views on American citizens and private companies when it declared that United Airlines, American Airlines and other foreign carriers should refer to Taiwan, Hong Kong and Macau as part of China in public-facing materials, such as their websites. The company’s runners-up for the top honor include “representation,” driven by the popularity of the movies “Black Panther” and “Crazy Rich Asians,” along with wins during the U.S. midterm elections for Muslim women, Native Americans and LGBTQ candidates. But the rise of misinformation, Solomon said, stretches well beyond U.S. borders and Facebook’s role in disseminating fake news and propaganda in the Cambridge Analytica scandal. The use of Facebook and other social media to incite violence and conflict was documented around the globe in 2018, she said. “Hate speech and rumors posted to Facebook facilitated violence against Rohingya Muslims in Myanmar, riots started in Sri Lanka after false news set the country’s Buddhist majority against Muslims, and false rumors about child kidnappers on WhatsApp led to mob violence in India,” Solomon said. Elsewhere in the culture, countless podcasts and videos have spread the absurd notion of a global cover-up that the Earth is flat rather than round. The idea of “misinfodemics” has surfaced in the last several years to identify the anti-vaccination movement and other beliefs that lead to real-world health crises, Solomon said. She pointed to “Poe’s law” in slicing and dicing “misinfo” and “disinfo.” The term, dating to 2005, has become an internet shorthand to sum up how easy it is to spread satire as truth online when an author’s intent isn’t clearly indicated. Columbus, Ohio – As the holiday shopping season gets underway, the Ohio Department of Aging, through its Golden Buckeye program and STEADY U Ohio falls prevention initiative, offers tips for consumers of all ages to spend wisely and shop safely. Ask anywhere you spend money if they honor the Golden Buckeye Card or offer another discount for which you may qualify. The Golden Buckeye Card is most often honored at locally owned small businesses. Consider payment methods carefully. Cash is the best way to control your spending but can be easily lost or stolen. Debit cards and checks can help you avoid finance charges but are particularly risky if lost or stolen. Credit cards often offer the best consumer protections against loss and theft but can cost you more in the long run in fees and interest. Compare prices using store sales circulars and websites. Save your receipts and continue to compare prices after you’ve purchased something, as retailers may match competitor prices following the sale. Shop at discount, resale and outlet stores for rock-bottom prices on unique gifts. Buy gift cards for shopping as well as giving. Many merchants offer special holiday offers on gift cards such as bonus coupons/cards, fuel discounts and other incentives. Buy gift cards to earn these perks, then use the cards to buy gifts. Understand return policies before you buy. Look for information about how long returns are accepted, if a receipt is required, whether opened items are accepted, if a restocking fee applies, and if a shipping fee applies to items bought online. Be careful and alert. Park in well-lighted areas and avoid leaving valuables in your vehicle. Never leave your jacket, purse or wallet unattended. • Don’t “shop ‘til you drop.” Do some light exercise and stretching before you shop. Take frequent breaks and shop at off-peak times to avoid crowds and long waits. Bring someone with you who can wait in line for you while you sit and rest. • Avoid walking around items blocking aisles or displays that block your view of other shoppers and obstacles. Report slipping hazards, such as spills, loose rugs or mats, and unsafe sidewalks or stairs to store staff immediately. • Ask store staff for help carrying heavy or bulky packages or bags to your vehicle. Avoid carrying large, low-hanging bags that can trip you. • If you use your cane or walker, always shop with it or take advantage of the mobility scooters many stores provide if you could be on your feet for longer than you usually find comfortable. • Tell store staff if you see anybody behaving in an unsafe manner that could lead to an accident. • If you fall, even if you’re not hurt, notify store staff and management right away so that they can document the incident and take steps to prevent future accidents. About ODA – The Ohio Department of Aging serves and advocates for the needs of Ohioans age 60 and older, as well as their families, caregivers and communities. Programs include home and community based long-term supports and services, as well as initiatives to promote health and wellness throughout the lifespan. Visit www.aging.ohio.gov. About the Golden Buckeye Program – Since 1976, the Golden Buckeye Program has been creating community connections between consumers and small business partners. The Golden Buckeye Card is available for all Ohio residents age 60 or older, as well as Ohioans age 18-59 with a total and permanent disability. Learn more at www.goldenbuckeye.com or by calling 1-800-422-1976. About STEADY U Ohio – STEADY U Ohio is a comprehensive falls prevention initiative led by Governor John Kasich and the Ohio Department of Aging, and supported by Ohio government and state business partners to strengthen existing falls prevention activities, identify opportunities for new initiatives and coordinate a statewide educational campaign to bring falls prevention to the forefront of planning for individuals, families, health care providers, business and community leaders and all Ohioans. Visit www.steadyu.ohio.gov. The Internal Revenue Service (IRS) is warning residents about an increasing number of fraudulent emails impersonating the IRS. According to the agency, the scammers use tax transcripts to lure unsuspecting people into opening documents containing malware. If you or someone you know receives such a message, do not open the email or the attachment and delete the email. Users can also forward the email to phishing@irs.gov. Remember that the IRS does not send unsolicited emails to members of the public. For more information, visit www.irs.gov. A great gift to give yourself — and the planet — is to skip out on those chemical-coated slips of paper. These unnecessary paper slips come with costs. It’s no surprise that paper receipts are wasteful, but many don’t know that they’re also a risk to human health. Thermal paper receipts are often coated with BPA, a known endocrine disruptor. BPA exposure is linked to increased risk of prostate and breast cancer, type 2 diabetes, childhood obesity, autism, and neurological problems. Many retailers claim to offer “BPA-free receipts.” Those use a similar substitute known as BPS, which is unfortunately just as toxic as BPA. According to the Environmental Science and Technology study, 81 percent of Americans have toxic chemicals, including BPS, in their urine — and most of it comes from paper receipts. During this busy season, cashiers face an even higher risk, as they deal with an even greater number of receipts every single day. A study by the Ecology Center found that cashiers that are exposed to paper receipts on a daily basis have 30 percent more BPA in their bodies than others. Most retail workers aren’t informed by their employer about the risks and therefore don’t take precautionary measures, such as wearing gloves. Thermal paper receipts also have a significant impact on the environment. In the U.S. alone, they require nearly 10 million trees, 21 billion gallons of water, and 250 gallons of oil every single year. On top of that, due to their chemical coating, these paper slips aren’t recyclable, since they could contaminate other paper products in the recycling bin. As if that weren’t enough, paper receipts significantly contribute to climate change: The greenhouse gases released from their production to disposal are equivalent to 1 million cars on the road. Offering digital receipts should be the default in 2018. The European commission has already issued a ban of BPA in thermal paper to begin in 2020. If the U.S. government won’t take action to ban these dangerous chemicals from receipts, then breaking the habit of taking toxic paper receipts would be the one of the best gifts we can give our planet — and ourselves — this holiday shopping season. Reduce your purchases as much as you can to curb consumption. When you do make a purchase, ask to opt-out of paper receipts during transactions. If you must take a receipt, fold it with the printed side facing inward. This lessens exposure, since the back of thermal paper is often not coated. Encourage your local retailers to switch to digital or non-toxic paper receipts. There’s a range of available alternatives on the market, including vitamin-C based ink. For immediate action, you can sign a petition urging retailers such as CVS to skip the slip at salsalabs.org/cvsskiptheslip. Your family, community, and the planet count on you to spread awareness on the issue. Skip the slip this holiday season and don’t forget to make it your New Year’s resolution, too. Ayate Temsamani is a Climate Fellow at Green America. Distributed by OtherWords.org.